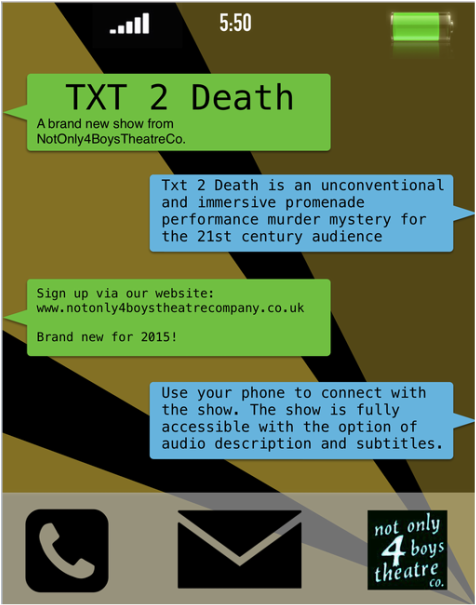 Txt 2 Death - NotOnly4Boys Theatre Co.
Txt 2 Death' is a innovative piece of street theatre combining live drama, 3D audio, mime, original music, dance, live and pre-recorded video with cutting edge location-based internet software and smartphone technology. When the audience book for the show they will directed to a page to download the app required for the performance. This enables them to access the 3D audio and video elements of the show. The piece follows four characters; all suspects in a murder investigation. It begins with the audience witnessing the murder itself. It then takes the style of a promenade performance with the audience members receiving location-based audio and visual prompts whilst watching the live content. Once the audience have made there own deductions and assumptions the denouement will take the form of a reversion to scene one. With the additional information they now possess the audience will be able to see the motives and actions of each character and see the murder from a different perspective. To date the app is already in place and the 3D audio and video accessibility in development. The script is outlined and will be refined in a week of R&D in Autumn 2015. The costume designs are complete and the soundscape design is underway, the original music is in composition and the choreography complete by christmas 2015. Creative team: Artistic Director: Joseph Thomas, App Developers: Bubbal, Choreographic assistance from: The Knotted Project, Production Advisors: Dizzy O’ Dare Presents, Composer: Joseph Thomas and Advisor: Julie Tate. This production uses 4 actors and 1 technician. The show is especially inclusive and accessible because of the app’s potential to provide audio description and subtitling and translation into other languages. The venue can be chosen to guarantee wheelchair access. Thanks to the pioneering people at Bubbal and their technology we have been able to make a completely accessible piece of exciting, interactive and enjoyable street theatre. You need to download the app from Bubbal If you don't already have it. You can download it here.